One Washable Bed Protector Pad with Blue top surface complete with Tucks. Absorbent Capacity: 3000 ml (3 litres). 2 LB White New Knit Rags For Floor Cleaning Blocked Pack For Each Display On Shelf For Painting & Cleaning.2 LB New Knit Rags for floor cleaning For Painting & Cleaning. ID# B2. Our range of Comfortnights® Terry Duvet Protectors are fully waterproof and are designed to support continence care and protect your duvet from liquid spills. Undetectable under your normal bed linen this is a superior product compared to the PVC versions on the market. The cooling gel regulates body temperature, while the open texture of the material provides proper air flow. 5 year Limited Manufacturer Warranty. 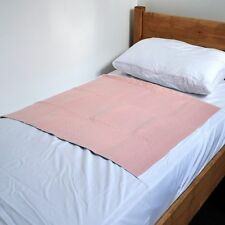 100% MEMORY FOAM MATTRESS TOPPER AVAILABLE IN ALL SIZES AND DEPTHS 1" 2" 3" 4"
Sonoma Extra Absorbent Pink Bed Pad with Tucks,Size 85 x 90cms,33½" x 35½"
Washable Bed Protector / Pad with Tucks. These premium quality washable bed protectors are warm, soft, comfortable and highly absorbent to keep the sleeper dry, reduce bedding changes and help prevent soreness and infection. This quality washable bed protector from Comfortnights is warm, soft, comfortable and absorbent and will keep the sleeper dry as well as reducing the need for bedding changes it will also help prevent soreness and infection. This premium quality washable bed protector is warm, soft, comfortable and highly absorbent to keep the sleeper dry, reduce bedding changes and help prevent soreness and infection. Two Washable Bed Protector / Pad with Tucks. Community Washable Reusable Absorbent Bed Pad, 60 x 60 cms, 23½" x 23½"
Protector Size: 60 x 60 cms, 23½" x 23½". Our resilient, top quality laminated reusable bed pad is a superior choice. Absorbent Capacity:1.5 litres. Re-usable bed pad, Washable at 95°C, Safe for the Tumble Dryer. 3'0" x 6'6" (90cm x 198cm approx). Size: 3'0" x 6'6" (90cm x 198cm approx) for electricbeds and longer sandard mattresses. Also available in 2'6" x 6'6" (76cm x 198cm). Luxury Microfibre Mattress Protector Electric Bed 3'0"x 6'6" (90cm x 198cm). Rest comfortably with gentle, continuous heat and a comfy climate zone, for individualized comfort. Made of 100% polyester. This extra-soft Polyester Headed Mattress Pad is machine-washable and dryer-safe without shrinkage. Two Reusable Bed Pads with Tucks, one in use, one as spare. Two Reusable Bed Pads with Tucks, one in use, one as spare. Absorbent Capacity: 2 Litres.